Last, but far from least, of the Batman cards available from 1966 is one of my favorite sets from this most iconic Batman era: the set known as the 1966 Riddler Back cards (this set is also sometimes called the Riddler's Riddle cards set). There are a couple of things about the Riddler Back set which really make it stand out! First off this set features photography entirely taken from the 1966 Batman movie with its budget which well out-weighed that of the TV series. 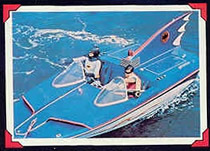 Not only does this mean we have cards showing some awesome bat-artillery (like the Bat Foil below) but we also see Batman's famous Bat Shark Repellent make an appearence - cool! Secondly these cards have an interactive feature - within each pack was a special decoder. 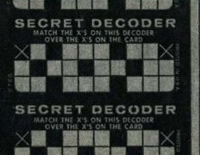 The decoder was held over the back of the card to reveal the answer to a riddle on the back of the card. 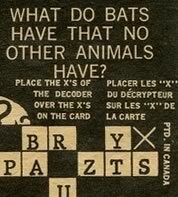 This is very cool as it takes the Batman theme further than any other set before (such as the Bat Laffs set which simply printed the answers up-side-down). Below I have a scan of the decoder and a see further down for sample card backs. An example riddle is (from card number 19): "What do bats have that no other animals have?" The Riddler's Riddle set contains 38 cards featuring full color photography. The photos utilise a thick white keyline along with red corners and an additional thick black border. Some of the actors appearing on cards include Adam West (Batman), Burt Ward (Robin), Lee Meriwether (Catwoman), Cesar Romero (Joker), Burgess Meredith (Penguin), and Frank Gorshin (Riddler). 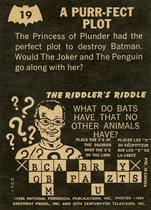 The card backs contain a storyline matching the front of the card along with a riddle posed by the Riddler. The answer can be revealed by using the decoder as above. All the card fronts of the variations above are the same, however as you'll see below, there are slight differences with the card backs. This set was produced by Topps for the USA market. The backs of the cards state "T.G.C Printed in U.S.A". Below are two front and back examples of the Topps Riddle Back cards. This set was produced by O-Pee-Chee for the Canadian market. These cards state "Copyright T.G.C PTD Canada". As an extra feature, the Canadian-produced cards not only feature the riddle in English but also show it in French Canadian. I've included a close-up below to show you this. Below are two front and back examples of the O-Pee-Chee Riddle Back cards. This set was produced by A&BC Bubble Gum for the UK market. On the backs these cards state "Copyright A&BC Printed in England". Below are two front and back examples of the A&BC Riddle Back cards. These cards are some of my favorite Batman cards - particularly due to the cool photos from the deliberately over-the-top Batman movie! The cards can be very hard to find in mint condition. The decoding feature means the cards were well handled and therefore well worn. Additionally, the black border shows any damaged edges or corners very clearly. Having said that though, I think slighly worn card which are over 50 years old have character and look great in any collection! The Riddle Back cards are fairly readily available for sale online and I highly recommend you check out some auctions if you're keen to own some of these cards! It's a good idea to track down a decoder also - these seem quite rare though there does seem to usually be at least one for sale on eBay at any given time. Happy collecting and best of luck adding some new cards to your collection!